Amsterdam, 26 April 2012. Norway’s Former Foreign Minister Thorvald Stoltenberg receives the award on behalf of the Global Commission on Drug Policy. Other winners are: Dr. Lester Grinspoon (extraordinary Professor of Psychiatry of the Harvard Medical School) and Dr. Frederick Polak (one of the most experienced and respected Dutch psychiatrists in the area of drug use). 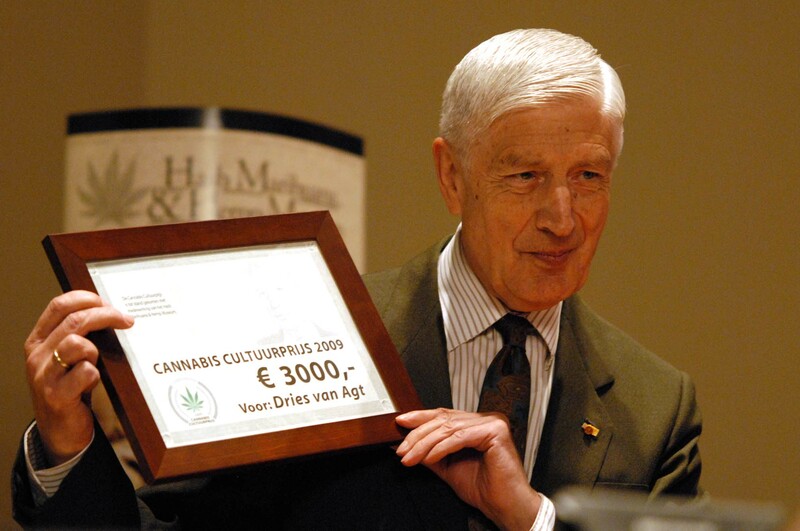 The Cannabis Culture Awards 2012 are presented by former Dutch Prime minister Dries van Agt. After the Awards ceremony, former Dutch Minister of Science, Public Health and Culture, Hedy d’Ancona will open the renewed Hash Marihuana & Hemp Museum. Since 2004, the Hash Marihuana & Hemp Museum in Amsterdam, grants the Cannabis Culture Awards to individuals and organizations who have commendably sought, for the acceptance of cannabis in all its forms and for the reintroduction of marihuana and hemp in modern society. The Cannabis Culture Awards have been granted to prominent figures in recent years, such as: former Dutch Prime Minister Dries van Agt, renowned Dutch poet Simon Vinkenoog and the American political and cannabis activist Jack Herer. The Cannabis Culture Awards have an international character. Consequently two weeks after the ceremony in Amsterdam, two additional awards are granted to: Fernanda de la Figuera (renowned Spanish cannabis activist) and Todd McCormick (renowned American author, photographer, cannabis activist). The ceremony coincides with the opening of the first Hemp Museum Gallery in Spain, which is situated in the beautiful renovated Palau Mornau in Barcelona. In the year 2012, the importance of the Cannabis Culture Awards is greater than ever. Even though more and more countries decriminalize cannabis, in the majority of countries repression, stigmatization and repercussion is still common good. Fortunately there is a counter movement. Sensible noble public figures and influential NGOs, who choose to let ratio and humanity prevail above political objectives. The Hash Marihuana & Hemp Museum in Amsterdam offers a unique permanent exhibition, on the development of the cannabis plant as a versatile source for industrial, nutritional, medicinal, sacramental and recreational purposes. The collection consists of rare items that founder Ben Dronkers, over the past forty years, collected throughout the world. Due to the overwhelming interest for Cannabis in southern Europe, a sister museum in Barcelona will be opened on 9 may 2012, the Hemp Museum Gallery. Both museums in Amsterdam and Barcelona focus on modern citizens, who despite repressive government measures, are not deterred, to gain knowledge about this particular plant independently. More information about the Cannabis Culture Awards 2012 can be found here. The Cannabis Culture Awards has its own importance I viewed press release where this performed.This was really great step. we have top marijuana strains for sell at very affordable prices, contact kceeburger10@gmail.com or call/text (575) 446-0938 for more info on how to place an order. Cannabis Insurance – crest insurance is a leading insurance provider company for all kinds of Cannabis insurance. We provide best plan according to the need of customer. I like your posted information through the blog! This is seems like to be a promotional for business owner. I really appreciate it and thanks for sharing.